Sunday evening my daughter and I went swimming at the Canada Games Pool in New Westminster. It’s a great pool - it has two moving bulkheads so the lane lengths can change according to the needs of swimmers/events. Last September the pool got a much needed paint job… and this is where the story takes a dive. Those of you following me for a while may recall that I have a mermaid for a daughter. Part of the fun of swimming with a mermaid is donning my flippers and pretending to be one too. I will swim for as long as I can on one breath with my body inches from the floor of the pool. Okay, so, my lovely mermaid daughter was out in front and since Courtney was using her mono fin there were bubbles in my vision - what I didn’t see was the bulkhead which I was approaching at a fast speed with my hands by my side (using only leg power for this kind of swim) and just like that I went face first into the bulkhead. OUCH TO THE TENTH POWER. My daughter, who witnessed this, as she tried to reach out and grab me before impact, was mortified. You would think I was blind, right, but here’s the thing, the bulkhead and the pool are both white - I am swimming low to the ground all I see in front of me is water, bubbles and white - there is a large gap under the bulkhead as I am swimming toward the deep end - I don’t see the bulkhead because it is blending in with everything around it. Water is moving freely under it - and… I’m wearing goggles to boot so it’s not like I’m swimming with my eyes closed. MY FACE IS A MESS… NO, I'M NOT UPSET - WHAT WOULD EVER GIVE YOU THAT IDEA! Anyway… the paramedics arrived followed by the ambulance and about five hours in Royal Columbian Hospital. Having had a pretty good concussion last year I was given a CAT scan to make sure my brain was okay - hmmm, that in itself was interesting - but verify I still have a brain isn’t a bad thing, eh! I was sent home where I went to my daughter’s place to be resurrected by some wickedly good chicken soup that her man, Eric, had made hours earlier. 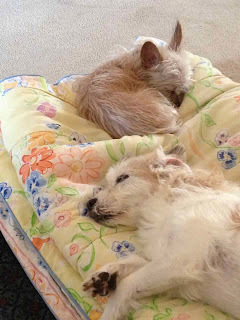 The kids looked after me real well and with the help of the hospital administered Gravol and Tylenol I made a go of getting some sleep. Here’s the thing - after two horrific car accidents it's this accident which is causing me no end of nightmares. Every time I close my eyes I am swimming, full speed, into a brick wall with my bare face - yikes, once was enough thank you very much. Seems I did okay the first night because the Gravol made me drowsy. Since I’m not a person that struggles with falling asleep I’ve not had to rely on “help” in that department. Trying to get some shut eye proved more difficult last night as I don't stock Gravol at home - note to self… pick some up!! And typing this - I’ve done it in fits and starts - but thought it might be of interest to read what happens when common sense is not prevailed upon when painting these bulkheads. A simple bright red line, about six inches high, running the width of the bulkhead’s base would have prevented this accident from happening. It is negligent on the part of the pool administration that this type of accident should even have the potential to happen. 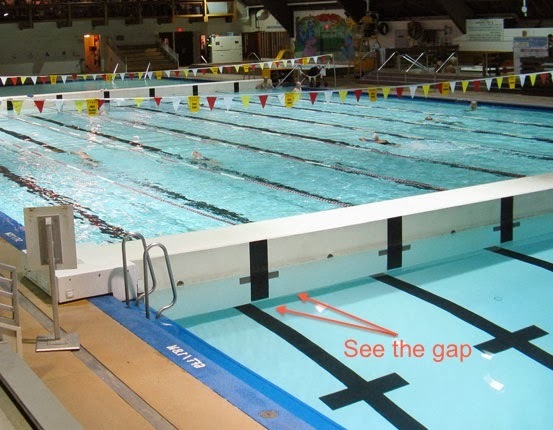 All bulkheads which are regularly repositioned where they DO NOT come in contact with the floor of the pool SHOULD be painted with a bright colour to be visible to all swimmers. You see, I’ve swam at this pool many a time - and I get it - I know you might think, well, shouldn’t she be aware of her surroundings - yes, I should - and I was. I was swimming the length low to the ground and here’s where the problem lies - the bulkhead does not touch the ground as the floor at this point is sloping toward the deep end and there is a gap about a foot high so from my position all that was visible was water. 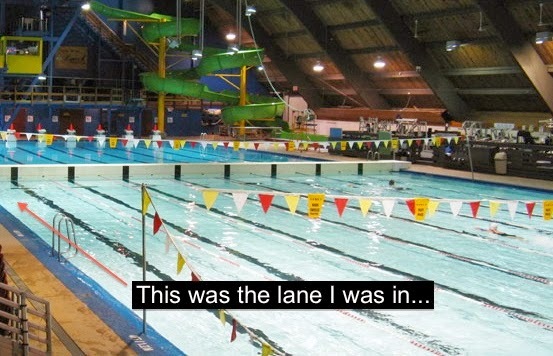 Had a bright red line been painted at the base of the bulkhead it would have caught my eye - I was careening at full speed toward that exact area - only visually my senses couldn’t separate the wall from the rest of the pool because there was no wall that low to the floor - get it! Well I sure did!! 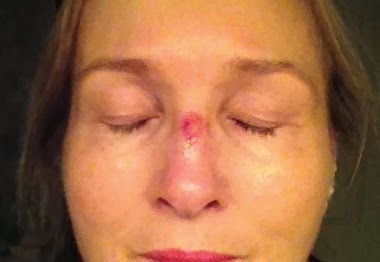 Smack in the face - my nose looks like I’ve been in the boxing arena for more than a few rounds. Yup - real pretty!!!! NOT! 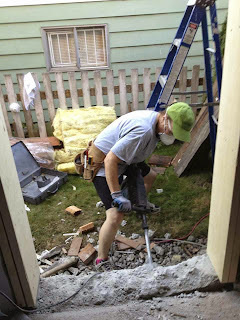 ON A MISSION… besides healing my noggin, resting and recovering I will be doggedly pursuing a positive outcome from my encounter with this bulkhead! I went looking to see who manufactures bulkheads and ended up on a website (where all these photos came from) and had the weirdest conversation with one of the owners. Actually, it begs some blogging time - and I will get to that later. I also googled FINA (Fédération Internationale de Natation) the International Swimming Federation and read their Facilities Rules and determined that there are no restrictions on having a bright red line painted around the bottom of a bulkhead. I will be emailing them about it nonetheless. Also, I’m in dialogue with the pool staff - just waiting to hear back from management. I was called today re “how I was doing” and indicated that while I will survive I am handling this like a dog with a juicy bone - not letting go until it’s done - to my satisfaction. Okay… I know, you’re going to say, “What’s all the fuss, it’s just a scrape”, right - well, it’s what you can’t see or feel - the pain of my eye sockets, front teeth and mostly my nose - I feel like someone's come at me with a bat. The skin around my eyes is starting to turn a greenish colour and while the swelling has come down my nose is too tender to touch. I'll be going to my family doctor for a follow up x-ray and check-up. The worst part is I have a moderate concussion - more than the visual stuff it's what the brain goes through when it has had this kind of impact that makes this very scary. The saving grace was getting ice on my face right away at the pool and then keeping it on while I was in the hospital; icing an injury really does make or break the impact bruising has on it. To end on a lighter note - I'd like to give a shout out to my friend, Botanist, and thank him for partaking in my January 1st questionnaire - which he answered over on his blog, Views From the Bald Patch. 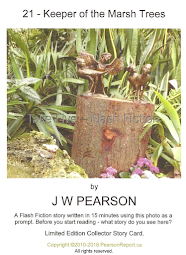 Drop by and give him a read - I find it interesting how he sees his year unfolding. Have you answered the questions? I answered them HERE. Here they are just in case you missed them - feel free to copy and paste if you want to use them over at your place. If you do a post with them let me know and I'll link to it here on Pearson Report. Did you accomplish what you had set out to do in 2013? Are you happy with your journey so far? Will 2014 be “the year”? What does that even mean to you? Did you make any resolutions? Have you made the same ones before? Why is the first of January different than the first of any other month? Or is it? If you could change one thing about “you” what would it be? Questions answered… hmm… okay - these will do. Me - hard at work, no hammer is too small! Well, seems like my good buddy Bushman got with the program and did just that - thanks! You can drop by and check out his answers (they are at the bottom of his great post, a worthy read) and then pop back here and see if I copied him!! For the most part - yes! I had two objectives - one, renovate my house and the other, renovate me. As to the house - it will occupy my thoughts again this year! As to me - success! I set out to reshape my body and regain my youthful energy to which I am happy to report I have done just that. My objective for coming years is to maintain my efforts. I am! Really that sums it up. But, for those wanting a bit more meat on the bone here’s the 411 - as my general countenance is “happy” no journey is ever less than that. Hence I am happy, journey or no journey. 2014 is just a number. Shockingly enough I’m in awe that I’ve made it to this number without being incarcerated much to complain about. It means this is the number I’m living in, at present, so I’ll do my best to stay in it and not drift back into the past with wishful refections, nor look too longingly into the future at what may or may not come my way. I’m partial to the firsts of all months and will on occasion use one as a benchmark of sorts. Mostly, going rogue, I will randomly select a date, with the help of a dart and my calendar, and start something without rhyme nor reason in the middle of the month. Now that’s living on the edge. I’m as close to perfect as the gods could make me - therefore I cannot risk their wrath by ever entertaining the thought of tampering with near-perfection. It could backfire and then what… I’d be like… you know… like, average! YIKES - not in this lifetime! And… if you’ve read this correctly you’ll understand that to me perfection lies in one’s ability to laugh. Those that can laugh at themselves, with others, and in the face of adversity are truly lucky and blessed for they get to grow old with happy lines etched on their faces. “Laugh and the world laughs with you, cry and you cry alone” - does this mean anything to you? Good Morning and Welcome to 2014! Yes, we resolve to get as much sleep as possible! I had a post all ready but at the tenth hour I pulled it, seemed all wrong in light of some sad news I received hours earlier. I’ve had a quiet easing into this New Year - I went all out and purchased a book, Zoo, by James Patterson, to bring in 2014. I made it halfway (it’s a page turner) and then the calls came - daughter and a few close friends wishing me a good one. I tucked the book in my nightstand, headed to the bathroom for a final tinkle and as it was the start of a new day I stood on the scale (as I do every day) and smiled. Yes, 2013 had been a great year in the weight and health department! I then crawled under the covers of my warm sheep-fleece comforter and said good-night to the universe - a nightly ritual. I lay there, mind swirling with thoughts of the sadness that had engulfed me earlier, and wondered how people carry on after a devastating tragedy. Were these people even worrying about resolutions - I think not. No, they will be more grievously occupied - death has a way of doing that. I thought of all the resolutions that were being made; lose weight, stop drinking, start exercising… the list goes on. A few weeks into this shiny, squeaky-clean New Year and many will have fallen off the scale; the wagon; the treadmill and sunk deep into the pit of failure, shame and despair. In the meantime the year ticks on - January 1st loses its lustre as February 1st looms on the horizon with March 1st nipping close on its heels. And so the months drift on. There’s always next year, the first day of another New Year, to try it all again. We are all mere mortals, full of failings, shortcomings and flaws. Stop aiming for perfection… it is unobtainable. Sorry to be the bearer of bad news. Instead seek out a happy medium - find a good balance - be gentle on yourself if you don’t hit the mark the first time. Eventually you’ll toss the whole "first day of a New Year" aside for a good book, or a quiet night curled up with a loved one by the fire laughing at all those sillies out there stressing over a day that has no more significance than any of the other 364 that follow it. Seriously… ask a person how important the first day of a New Year is when they are grieving over the loss of a loved one… and the only resolution they wished they had made was to say “I love you” a little more often, to hug a little longer, and show kindness daily. Thank you for stopping in and letting me share my thoughts. I would like to leave you with these questions - to ponder, and to answer, if you’d like, in one of your future posts; link it back here and I’ll make mention of it on my blog.